With a 5000 year legacy of rock paintings, the exuberant landscape of Santinho Beach is the symbol of our history. Costão: a family of 900 smiles sharing 3 shifts, 25 cells and 8 offices. Our mission is to please our guests. From Azorean to international cuisines, our guests experience the best gustatory experiences in our 4 restaurants. The 5000 years of history of Santinho Beach become evident at the Costão Archaeological Museum, the first open-air museum in Brazil. Waste sorting unit, responsible for collecting, treating and ecologically correct disposal of solid waste from the Resort. The Conservation Unit – the Private Reserve of Natural Patrimony of Morro das Aranhas – is surrounded by different natural protected ecosystems and a rich diversity of soil, fauna and flora. The sustainability team of the Resort operates the IAS Social Project for school visiting tours and debate on the fauna and flora of Morro das Aranhas. Costão provides canoes and fishing nets and buys most of their tainha fishing to maintain the traditional artisanal fishing alive in the community. 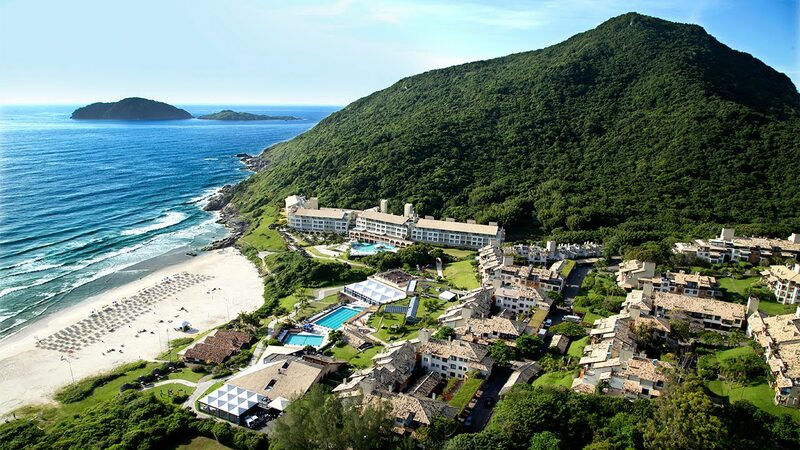 Relax in one of our 53 relax-weight loss-beauty of the Top 3 Spa of Brazil. Practice concentration and aim within the 3000 yards of Costão Golf – which was built based on the reduction of environmental impact. Considered one of the best tourist destinations of Latin America by New York Times, and also the most receptive city in the world according to Condé Nast Traveler, Florianópolis gathers tourists from several countries throughout the year. Azorean traditions and the livelihood of fishing communities coexist with modernity. Legends and superstitions, inherited by all generations, have been collected by the historian Franklin Cascaes and still impress locals and tourists visiting the island today. Along the more than 40 beaches in Florianópolis, the Island shows what makes it so special: international clubs in Jurerê, Lagoinha do Leste yet unreached by electricity, quiet waters of Daniela, huge sea waves at Joaquina and, at Santinho, the prehistoric rock paintings. At Santinho, the registration of past civilizations make the visitor’s experience still more worthwhile. It is part of the legacy of the Sambaqui (3000 a.C.) and Carijós from Tupi-Guarani nation (1500 d.C.). Beaches of white sand and crystal clear water, an ideal environment for radical sports, gastronomy based on fishing and a rare balance between quietness and activities. This island of mysteries and legends – The Magic Island – combines the slow pace of life with modernity in one of the cities with the best standard living in the country. Among attractions, Ponte Hercílio Luz, the largest suspension bridge of Brazil, is the main postcard of the Island and has been part of the life and the landscape of the capital of Santa Catarina for almost a hundred years. From check-in to check-out, the presence of each visitor is permeated by our institutional pillars, our mission and the principles of our services. The 5000-year heritage of Costão is present in our 25 year-history and in the vision of an inspiring future. Our union is the result of the excellence of our commitment to valuing the human being that makes the Costão unique. Our relationship with the environment is largely the result of a continuous interaction between Nature and Human Beings. Building memorable experiences for our guests is a mission shared by all of partners of our system. Ours is a large, strong and permanent system, settled by our beliefs and comprehensive for our dreams. Our essence is to preserve the natural ecosystems that surround us. The perpetuation of those resources is a priority within our vision of the future.